In part 1 of this essay I talked about using randomness to generate a dungeon of your own on the fly. That’s easy to say, but might you actually do it? First, there are online generators. Just adjust a few variables and bam (actually, click, but nu), dungeon. A quick search turned up this rather nice one by donjon, which also has a number of other potentially useful generators. The benefits of this approach include instant map and layout, with (depending on what generator you’re using) room keys that may specify encounters, decor and treasure. The downsides include some difficulty in fitting those keys to what you want for your campaign world, in terms of content and atmosphere, largely due to a sort of generic feel. Second, there’s the infinite power of Google. Search for a floorplan, decide on what kinds of things will be in it, do some image searches and start grabbing interesting ones to paste in. I can’t think of a better example than the first person I saw using this technique [http://dndwithpornstars.blogspot.com/2011/11/it-came-from-white-dwarf.html], Zak S.
This method is nice because it offers orders of magnitude more control than the previous while still saving you a lot of time and possible art-related stress. It also conforms nicely to almost any amount of time you care to spend on it. The downsides are that the stocking method requires a lot of on-the-fly DM judgments about stats, and that if you’re feeling picky it can take a really long time to find something that satisfies you. Third, there are geomorphs. Using these is much like using a dungeon generator, but with greater ability to tweak, and infinite extensibility. As things currently stand, most geomorphs seem best suited to generating huge sprawling complexes. That said, if you’re only looking for a tiny cave, it should often be possible to just grab a likely-looking block and ignore the extraneous exits. Fourth, especially if you’re at the gaming table without internet access and need to really make a dungeon on the fly, you may want to think of some rules for dungeon generation using dice. Note that even with the dice helping you, this method requires you to think fast on your feet, and it really really helps to build your random tables ahead of time. That said, here’s a quick example I just whipped up. 1 – tiny room, 2 – medium room, 3 – large room, 4 – hall, 5 – grand hall, 6 – complex room; roll twice and combine the results in some way. 1 – dangerous enemy or large crowd of weak enemies, 2 – moderate enemy or moderate crowd, 3 or 4 – minor encounter, 5 – normal animal(s), nonhostile, 6 – NPC(s), nonhostile, 7 through 10 – empty. If they differ by 6 or more, there’s nothing else special about the room. Sorry. If they differ by 5, any current inhabitants are already fighting or otherwise in a tight spot; if empty, there are signs that there was a recent battle or other danger here. If they differ by 4, the furnishings and decorations are especially ornate (evens) or spartan (odds). If they differ by 3, there’s a secret (door, compartment, etc.) or clue (for example, if you’ve decided the dungeon contains a dragon, there are some old flaked-off scales scattered around; if it has a basilisk, there’s a curiously lifelike statue). If they differ by 2, there’s something technically ordinary that still stands out (fresh animal droppings, graffiti left by bored inhabitants, etc.). If they differ by 1, there’s an extra trap or hazard. If they’re the same, there’s a treasure! 1 – locked, 2 – trapped, 3 – stuck, 4 – weird materials or nonstandard shape, 5 – alarmed or guarded, 6 – roll twice and combine. I’m not saying this is all you’ll ever need for a dungeon. You can add more tables containing other details. You’ll probably want to adjust these tables to fit your needs and style even if you decide to use them. And even if you use them as-is, it won’t work too well without some improvisational ability, and perhaps a bestiary with multiple indices you can use to generate foes. But it’s better than nothing if you want to give the PCs some controlled space to explore. Of course, these posts will have been most successful not if you just use my suggestions – although that would certainly be gratifying – but if my thoughts on the matter inspire you to create, and what you create makes your gaming fun and interesting. 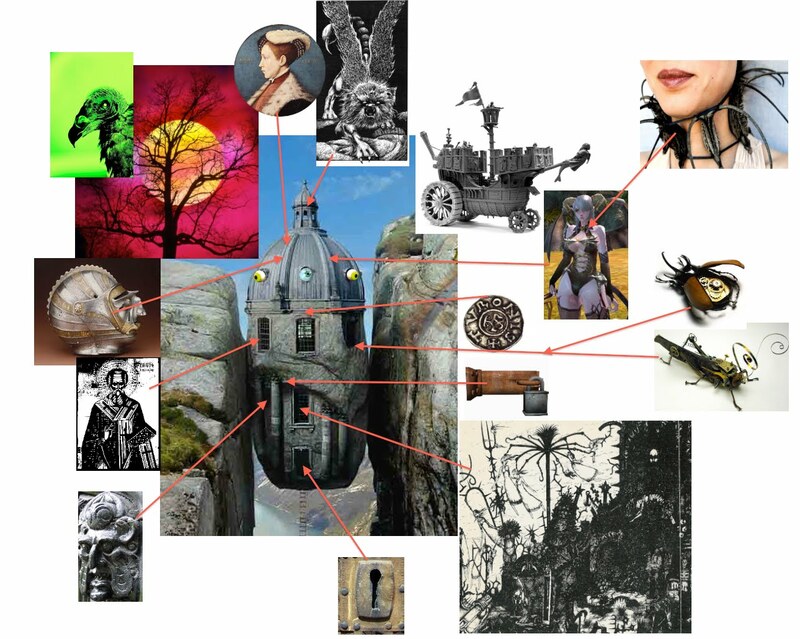 This entry was posted in Essay, Nonfiction, World-Building and tagged adventure setup, dungeon, dungeon design 101, Dyson Logos, gaming, Geomorphs, maps, random tables, RPG, searches, Zak S. Bookmark the permalink.